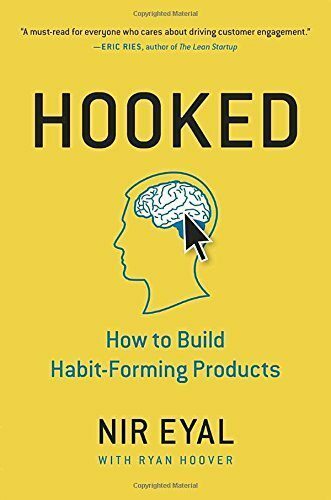 Hooked: How To Build Habit Forming Products is a crystal clear take on how to build products that keep users coming back for more. The Hooked methodology works perfectly for technology startups and potentially even physical products. Whether you are an entrepreneur, marketer developer or innovator you can benefit from the habit-forming qualities inside this book. 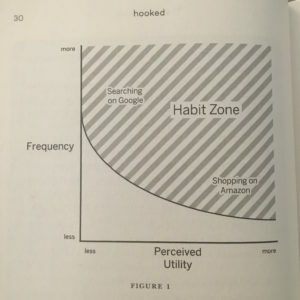 The core message of Hooked is that every person is programmed in such a way that their lives revolves around habits. The fact is that habits help us make easier, quicker decisions. The brain stores behaviors and automatic responses for different situations as a survival mechanism. Thus, past success can drive future actions (habits). We as humans use tools for productivity and the smart phone is a tool unlike any other. It is quite literally the computer that we carry around in our pockets which can play games, record video, watch movies, communicate, access tools, pay for purchases and infinitely more! A growing generation of mobile devices means time and attention are going towards our phones, and since even Silicon Valley is trending towards app startups, it makes sense to understand the Hooked model thoroughly. By training users to pick up a new habit, the person is essentially reprogramming the way they do things. Instead of spending money on advertising, focus on creating a product that truly enhances the customer’s day-to-day lives. The fact is that successfully changing long-term user habits is exceptionally rare. To build a mind monopoly one must provide a service that is not just marginally better but nine times better. Being first to market (and the mind) is just as crucial. Google vs Bing is a perfect example. All humans are motivated to seek pleasure and avoid pain; to seek hope and avoid fear; and finally, to seek social acceptance and avoid rejection. Although seeking pleasure and avoiding pain are key motivators in all species, make sure your core product is a “painkiller” rather than a “vitamin”. A habit is when not doing an action causes a bit of pain. Understanding cognitive biases and core motivators of humans will be key to building a product that taps into psychological triggers both external and internal. The FOGG behavior model, represented by the formula B = MAT represents that a given behavior will occur when motivation, ability and a trigger are present at the same time and in sufficient degrees. If one of these factors is missing then the ability for action is limited. For example, if your phone rings but it is on silent, the trigger is missing. If you get a phone notification from your annoying school bully, then motivation is missing to reply. If the phone rings and it’s your girlfriend calling but your legs are immobile then action is missing. Subsequently, all 3 factors must be maximized to achieve the desired behavior from the user. 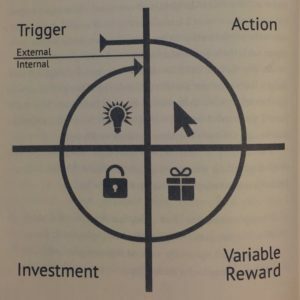 Variable rewards, when compared to static rewards, are key to dramatically increasing the amount of times a “pigeon taps the lever”. You want the user to keep coming back for more and each time not knowing what they are going to get. Variable rewards are the drug that keeps users addicted. There are a few types of variable rewards that work especially well to influence the human psyche. The Tribe – Our brains are adapted to seek rewards that make us feel accepted, attractive, important and included. Reward: Connectedness with other people. The Hunt – The need to acquire physical objects, such as food and other supplies that aid our survival, is part of our brains operating system. Reward: Material resources and information. The Self – The rewards of the self are fueled by “intrinsic motivation”. The self-determination theory espouses that people desire, among other things to gain a sense of competency. Adding an element of mystery to this goal makes the pursuit all the more enticing. Reward: Intrinsic rewards of mastery, competence and completion. When autonomy feels threatened it is human nature to feel constrained by lack of choices and rebel in reactance. Giving the user autonomy within your product will lead to repeat engagement. Before users become hooked to your product and create mental associations with automatic behaviors, they must first invest in the product. At a simple level the more users invest time and effort, the more they value the product or service. Give the user freedom to explore and let them invest themselves into the app. As humans we tend to overvalue our own actions and seek to be consistent with past behaviors. This means that as soon as we find a solution that is better than an old way of doing things and enjoy it, we are likely to switch over to the new solution. Minuscule improvements or marketing angles will do little to persuade the person to another product unless it is better by numerous factors. This means that if you score big on a habit-forming product it will be difficult for competitors to come in and take your users. When we see others enjoy awesome things, we try a little harder and condition ourselves over time to enjoy it too. A great recent example of this is the timing of Uber and Lyft where a 3 year head start can make a world of difference in users and investors. Habit forming technologies adapt to our needs by allowing us to make investments in the product to enhance the experience. Every song added to iTunes and every film uploaded to Netflix means more content and value for the user. Information generated, collected or created by users whether it is a photo, video, tweet or news link are examples of stored value in the form of content. By getting users to upload their own personal content, the effort associated with providing the data and the rewards received from other users combine to create a powerful hook that brings people back to the service time and time again. Followers, likes, friends and badges are fantastic rewards for investing in a product. These investments by the user are excellent opportunities for loading personal triggers, and hence the Hooked cycle goes on. 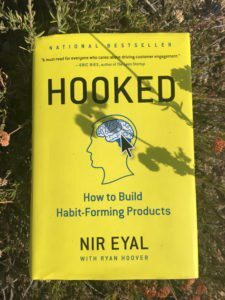 Learn more about Hooked on Nir Eyal’s blog.